Westminster Mint Hosts Former Delaware Governor Mike Castle, NGC Vice President and Author Miles Standish. 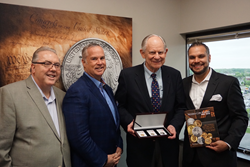 Former Delaware Governor Mike Castle visited Westminster Mint’s Corporate Headquarters in Minneapolis for a meet and signing event that also included NGC Vice President and renowned coin author Miles Standish. Castle was Governor of Delaware from 1985-92 and spent nine terms as a Delaware Representative in the U.S. House of Representatives. While in Congress, Castle wrote and/or sponsored the bills that created the 50 State Quarters® Program, the Sacagawea Dollar, the Presidential Dollar Series, the American Platinum Eagle, the America the Beautiful Quarters® Program and a number of modern commemoratives. The impact of the 50 State Quarters, in particular, can hardly be overstated. It is estimated that 150 million Americans — half of the country’s population at the time — became casual coin collectors because of this series. Many became more serious modern coin collectors, which had a transformative effect on the hobby and propelled modern coin collecting into the juggernaut that it is today. Castle is even more proud of the 50 State Quarters’ financial success. The 50 State Quarters Program netted nearly $7 billion in profit for the US government — an astonishing amount raised without levying any taxes. Westminster Mint was established in 2001 to provide an online platform and dependable service for people who require low prices and fast, physical delivery of their gold, silver and platinum bullion bars, coins and rounds. Westminster Mint is one of the leading coin dealers in the USA and is active in most sectors of the collectible coin market including ancient and modern issue, international issue, coins from hoards and shipwrecks, certified coins and banknotes. We proudly employ a team of highly trained, dedicated specialists with vast knowledge of and a love for the numismatic industry. Our team members provide a personalized one-on-one service and can help you acquire almost any coin for your collection. Ian Clay, President of Westminster Mint, is a Lifetime Member of the American Numismatic Association. Westminster Mint is an authorized dealer for coins that are authenticated, certified and graded by the American Numismatic Association Certification Service (ANACS), by Numismatic Guaranty Corporation (NGC) and Professional Coin Grading Service (PCGS). We are an Accredited Member of the Better Business Bureau (BBB) and licensed by the State of Minnesota Commerce Department as a Bullion Coin Dealer. Clay is the author of the book Modern Coin Rarities – 1986-2016, that identifies 46 of the most important and collectible gold, silver and platinum collectible coins issued spanning three decades. ANACS, NGC and PCGS each offer certified labels that identify coins featured in the book Modern Coin Rarities – 1986-2016 that allow collectors to customize their sets, enhance the quality of presentation, and add a level of exclusivity and collectability. We are honored that Michael Castle, the Coinage Congressman and two-term Governor of Delaware wrote the foreword to the book.